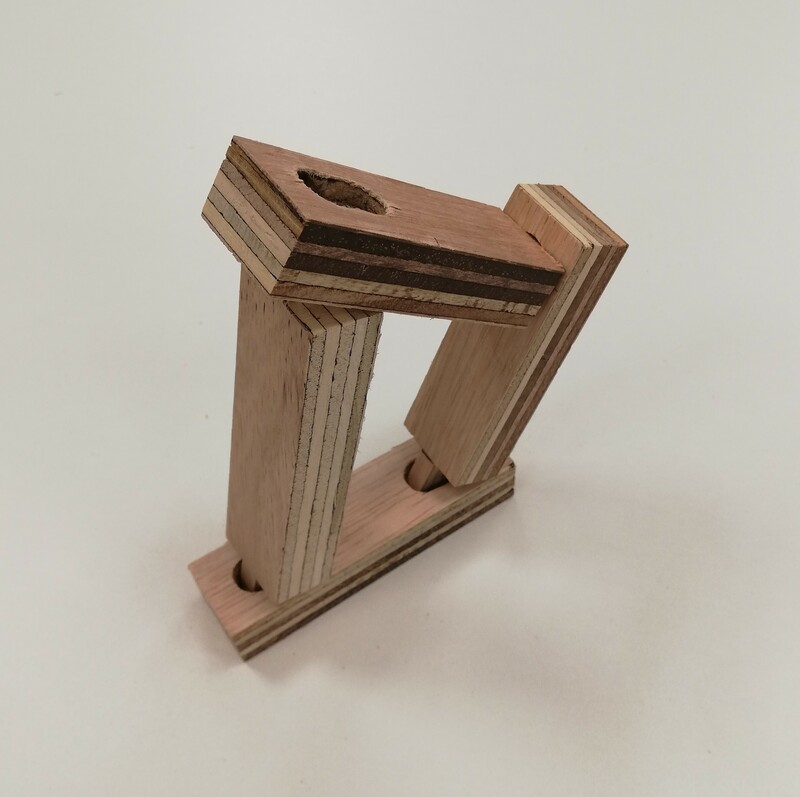 Brief from the Intro to 3D workshop: create a freestanding wood sculpture with no glue, preferably exploring joining methods. My original intention was to take 5 pieces of wood and some dowel and create a pentagon which would stand upright, possibly with a small cut out leaf suspended in the centre. 4/5 of the joins would be the trimmed end of one piece inserted into a hole drilled into the end of another, while the 5th would be a piece of dowel threaded between holes in the end of two pieces. The leaf plan got scrapped pretty quickly just because of time constraints, and I also soon realised that I needed to make the holes longer because the wood pieces were thicker than I originally factored in. I solved this by just drilling a second hole next to each initial one. While I was making the piece, although pretty comfortable using the drill and bandsaw, I was aware that I was lacking a certain level of skill and that it was showing in my work. I actually appreciate this as a part of this piece, because the marks of the process (eg rough edges or slightly wonky drill holes) mean that the process isn’t erased from the finished piece. The appeal of the sculpture comes a lot from the striations built into the wood, and when there’s so much interest in the material I think there’s interest to be had in an awareness of the process, it in turn also emphasises the material. Further on my lack of skill/practice, when I tried to put the pentagon together the angles were off (because of the thickness I didn’t take into account, I think) so it was unstable and didn’t fit together neatly like I’d planned. I also like this version with one more piece removed, as I think it makes the viewer connect the last join in their imagination which I like. But I also think it looks slightly too close to anthropomorphic, a bit like it’s hanging its head, and I don’t like the emotion of that. Despite the fact that the final work is not what I planned to make, I’m still very happy with it. It displays the beautiful striations of colour in the material, and forms an interlocking, self-supporting, and self-contained whole, which was the point of the original: although it seems different, it maintains the essence of what the original was for me. The colour layers in the wood are so interesting that I’ve discussing creating something similar in different media. It’s almost like an opera cake: maybe I’ll practice my Genoese and try an edible version. It’s been over 8 years since I did DT in school, and I wasn’t expecting to ever be reminded of how much I enjoyed tinkering around at 13 making picture frames and rotating toys and getting covered in glue and sawdust. But the smell of the workshop was an immediate nostalgia trigger, and comforting in a way that you wouldn’t expect a room full of power tools to be. It was really odd to walk into a room, where I’ve never been before, but which held a familiarity nearly a decade un-felt.